As our Colorado vacation wraps up, I am loading all the photos onto my laptop. This photo was taken on the dock on Dillon Lake during my cousin Katie’s wedding rehearsal BBQ… the boys were throwing rocks by the girls on the dock trying to get the biggest splash. 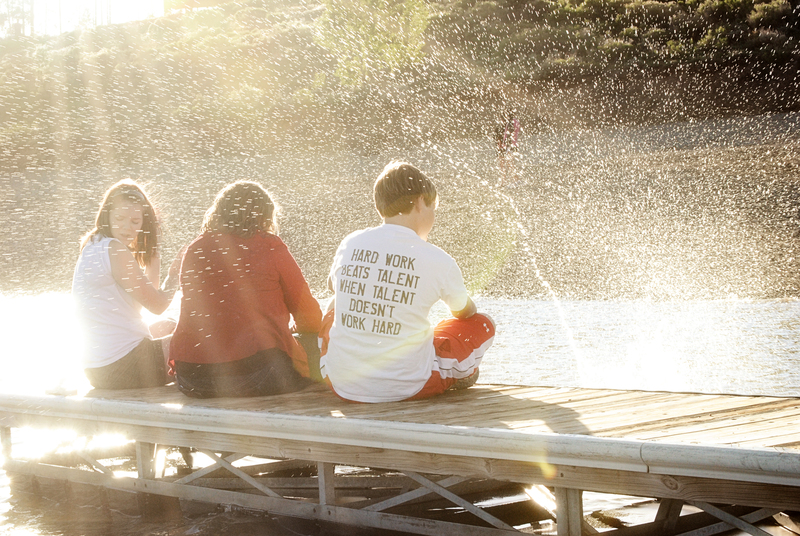 As I took photos, Andy started in on the fun… so here’s a photo of Elise, Jackie, and Jake on the dock with a rock splash from Andy. It just screams summer to me: fun, sun, and water! P.S. We are on our way home tomorrow. While I am sad to leave this most beautiful place, I am ready to be out of the altitude. I’ve been sick the whole time we’ve been here either from my cold or with a headache. Actually, the only day that I wasn’t sick one bit was the day of the wedding! That worked out perfectly!